Still time to get new decals before the busy summer months of 2019. 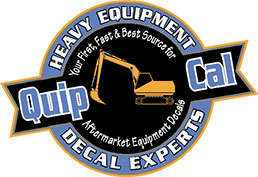 We have decals for all your heavy construction and industrial equipment. for graphics for your lowboy tractors or sales vehicles. Are your cranes or manlifts due for annual inspection? Do you have worn or or damaged safety decals on any of your units?Let us help you to remain safe AND compliant. Crane safety decals sold in sets or individually. Business hours are 10:00 am - 6:00 pm eastern standard time, Monday through Friday. Email inquiries are checked and addressed throughout the weekend. For best service, please provide the make, model, year, and series of the machine you're working on. You'll receive a prompt quote which will be sent to you by email along with a preview image of the decals. If we don't have the set you need, we'll create it. Complete Corporate Branding graphics for trucks, construction equipment and support vehicles. All produced as ordered and produced from our extensive and growing digital inventory. You'll be working with industry pros. We know equipment, we know decals, and we understand the world you work and operate in. When you call, or email, you'll deal with a person whose mission is to get you the decals quickly and easily so you can get back to your day. You'll be able to count on a team of people committed to producing and shipping a good product quickly. Call or email for a quote today. You'll be glad you did.